The month started off with a fun visit to a new spot in River North, called Katana. An upscale restaurant offering authentic Japanese eats including sushi and with a sophisticated sake menu. Japanese food is the way to my heart, and there can never be enough Japanese restaurants in the city where I’m concerned! I was super excited when Katana opened and more so when I walked into their expansive, chic space with a beautiful bar right at the entrance and two separate Robata and sushi bars. The interiors are absolutely gorgeous! A good friend, Joe Siprut, who also happens to be one of the investors there set it up for us, and I got a little taste of how this LA based concept is assimilating in Chicago. We also got to hobnob with local sushi legend Jason Chan, who also manages the restaurant. And needless to say, the restaurant is in very good hands. We ordered a la carte but not without beginning with a couple glasses of the sweet, milky Kurosawa from their extensive sake collection. Had I not been on a work break, I would’ve certainly indulged in one of their craft cocktails, which was intently calling my name. 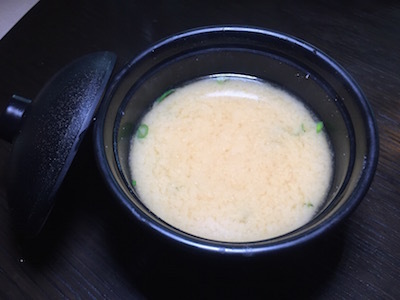 The Miso Shiru was just the perfect palette kicker, smooth and not overly salty. The Hanabi from the Cold section was remarkable and my favorite Katana eat. 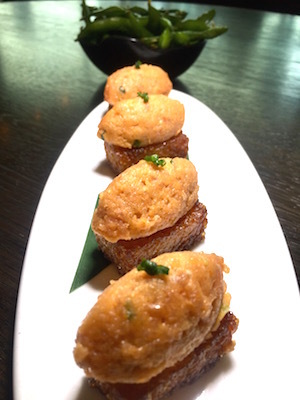 Spicy tuna served on crispy rice fritters and nothing like I’ve ever had before. The texture combo of the soft fish and crunchy rice was entirely delicious. From their array of robata selection, I ordered the Tako (Octopus), which came with a zingy Serrano cilantro sauce and toasted macadamia nuts. For those of you well-versed with tako, you know that the cut is thin and cooked to preserve the chewy texture. The preparation stayed true to the dish. We switched it up with something vegetarian and ordered the Eringi, which was a dish comprising of King Trumpet mushrooms with almond sauce. It almost had a peanut sauce type consistency to it. Although these mushrooms are not native to Japan they’re popular with the cuisine; a first for me, but thoroughly enjoyable. My sushi roll picks would be the White Lotus with shrimp tempura, avocado, and daikon sprouts and the namesake Katana, which had spicy tuna and jalapenos in it. I especially appreciated the tuna sashimi garnish on each piece, which looked pretty but tasted pretty amazing too. There wasn’t room for dessert, but I had to leave something for my next visit, because there will undoubtedly be one soon. If you haven’t been to Katana yet, you’re missing out. And you should absolutely consider their space for your holiday party this year. Recently I visited the newly opened Nick’s Pizza in Lincoln Square for an intimate pizza dinner with some other foodies and owner himself, Nick Sarillo. At the dinner, Nick addressed the group to give us a little background on the restaurant and his passion. Then we stuffed our faces with a variety of delicious pizzas and bar bites. Honestly, it felt like a family dinner and was a nice change from the usual overcrowded restaurant events. All kinds of munchies came out from mozzarella sticks, fried mushrooms, chicken wings, including a few orders of their delicious Fried Jumbo Shrimp for this pescetarian. We ate several pies, and I got my first taste of a Double Decker Cheese Pizza which literally had two crusts and two layers of cheese. All the dough and sauce at this restaurant are a product of a 50 year-old family recipe, and cheese that comes from 100% real milk mozzarella. All toppings were immensely fresh also! All guests including me had a gala time, eating, drinking and enjoying in a space that was designed by Nick’s brother and architect, to give it that cozy feel and create a family vibe. This is a family-owned restaurant after all; but I learned just how value-driven the company is during the tour, after dinner. The restaurant operates strictly on its values with the idea being to create a fun and open environment and to honor relationships with the community they’re a part of. No wonder the employee turnover here is way lower than industry standard. We got to see the behind-the scenes work and I was so happy to see so many smiling employees. 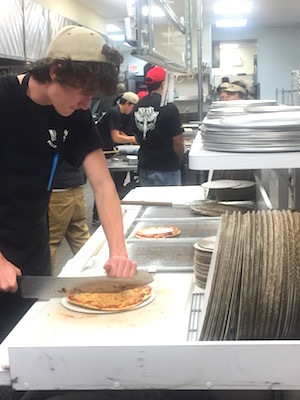 Fresh pizzas were coming out of the oven and it smelled so good. Thankfully I had just eaten. So if you haven’t visited the pizzeria yet, you’ve got to go! Good food, good people! What does the heart crave on a cold winter night? Nothing more than a warm bowl of pasta, I reckon! The night before Thanksgiving, I made my way with a guest to Tuscany Restaurant, another Phil Stefani classic for a tasting, and couldn’t have been happier. If you’ve been to this Little Italy favorite, you can agree that it has the cutest and coziest décor with some of the best service in the city. 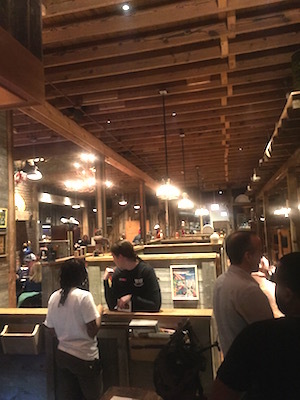 Every server has been working there for at least a few decades and seems so joyful. What a great testimony for the restaurant! The restaurant was also nicely decorated for the holidays when we walked in, and were seated at a corner table by the window in their beautiful dining room. The restaurant was abuzz even the night before Thanksgiving, which was nice to see. Wine seemed imminent in this set up and we got ourselves a bottle of the Ruffino Aziano Chianti to jumpstart the tasting. Like any other Italian eatery they bring you warm bread but Tuscany takes it a step further with their roasted garlic which is squeezed right in front of you to dip into! I was already satiated with this but there was a whole lot more to come! Our server recommended the Calamari Fritti (sautéed version) and the Polpi (grilled octopus) for our antipasti, and we agreed. The latter was undoubtedly my favorite dish of the night and likely the month! A beautiful plate of stewed baby octopus came served on a bed of tri-colored salad and balsamic vinaigrette, which made for an unusual dish with some amazing Sicilian flavors. The Spaghetti Di Mare was also phenomenal and came with all the Frutti my heart desired; shrimp, calamari, mussels, clams and an out-of-the-world marinara with toasted garlic and herbs. This dish is messy and dramatic, but almost non-negotiable in any Italian meal. A must for any Italian seafood lover. We asked for a half portion of their Linguine Con Scampi, which was still a hearty-sized plate of pasta with enough leftovers. A delectable dish of shrimp, garlic, hot peppers and crema alle was brought out emitting all the lovely Italian flavors. This is not a dish to be missed. We went traditional with the vegetarian dish too, and asked to try their Melanzane Alla Parmigiana (eggplant parmesan). A large platter of tender eggplant placed in a generous serving of tomato sauce was placed in front of us. I loved how cheesy yet non-greasy their version of this Italian favorite was. And most of all how unafraid Chef Padilla is to use garlic in all his dishes! If you’re wondering whether I got my pasta fix after all of the above, I sure did! But no one said anything about a sugar fix. Dessert was next, and there was a resounding consensus on the Crostata Di Cioccolato between my guest, our server and me. The pecan crust on this housemade pie was insane! The strawberry glaze added a cool tang to the sweet white and dark chocolate and just to clarify, there were no leftovers here! Tuscany knows and does Italian food without abandon and stays true to Italian cuisine. The vibe certainly adds to the whole experience, but I can guarantee you, you wouldn’t leave this restaurant without a smile on your face. And if you’re not smiling, its only because you couldn’t help but eat too much! Your next family gathering should absolutely be at Tuscany! They have locations in Oak Brook and Wheeling if you’re not in the city and can also host events!